My mom gave me this recipe many years ago, and it was an old faithful of mine for a long time, especially when I was looking for something economical, healthy, and still yummy. I’ve modified the original recipe only by adding more veggies. It’s pretty easy to make! Most of the time you need for this one is cooking time – you can be done in just over an hour, including 45-50 minutes of cooking time. 1. Heat a large pot to medium heat, and add the chopped onion once the oil is hot. Let it cook for a few minutes, stirring from time to time, until slightly browned. 2. Add the garlic, mushrooms and carrot, cooking for a few minutes. 3. 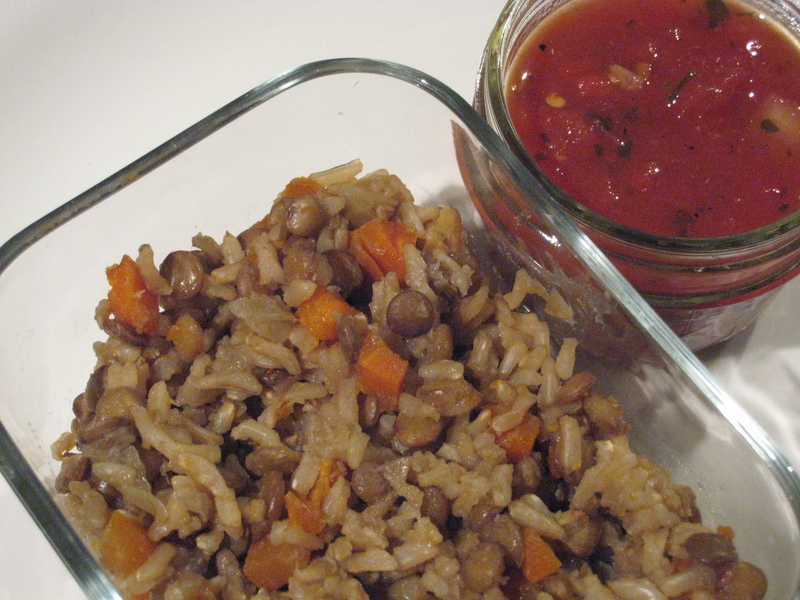 Add soy sauce, lentils, rice and water. Bring to a boil, reduce the heat to low, and cook 45 minutes with a lid on. 4. If it’s still a little watery at the end of the cooking time, just turn the heat up a little and cook it off. 5. Serve with salsa, and you’re ready to go!